Frontierland's original design was inspired by Walt Disney's interest in the American West and Mexico and eventually tied in well with two of Disney's first television successes: Davy Crockett and Zorro. Early on, the emphasis was really on recreating the old west with stagecoach rides and the like, but the difficulty of mixing live animals with guests eventually phased out much of that resulting in a more sterile Frontierland. Geographically, the land has gone through a lot of change over the years, expanding and shrinking. Ultmiately New Orleans Square and Bear Country (now Critter Country) would be carved out, leaving us with the land we know today. Location: On the west side of the park, extending along the waterfront all the way around to Harbor Galley. Big Thunder Mountain Railroad Take the wildest ride in the frontier in one of these mine trains. Big Thunder Ranch A small petting zoo at the back of Frontierland. 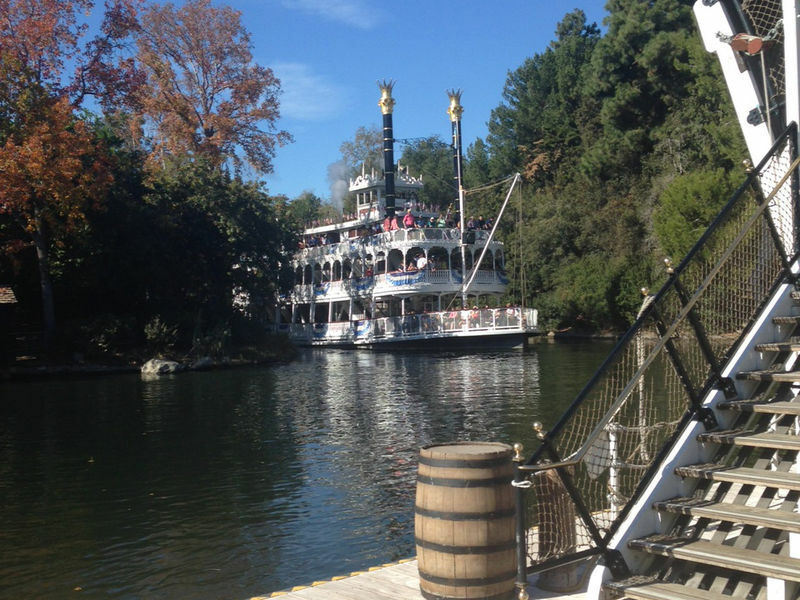 Mark Twain Riverboat Tour the Rivers of America on a classic Mississippi riverboat. Pirate's Lair on Tom Sawyer Island Take a raft to this playground island full of adventure for kids. Sailing Ship Columbia Learn about life on a large vessel during the Age of Sail on this reproduction of the first U.S. to circle the globe. Fantasmic! A journey through Mickey Mouse's imagination involving effects of all types and just about every character you could list. Frontierland Shootin' Exposition For fifty cents, test out your marksmanship. Harbour Galley Seafood soups, sandwiches, and salads served from a small dock overlooking the Rivers of America. Rancho del Zocalo Restaurante Mexican and Southwestern cuisine. Now serving breakfast. River Belle Terrace Located near the Rivers of America, choose from a selection of hearty starters, delightful sides, salads, sandwiches, fresh fish and tasty barbecue favorites�including ribs, chicken or beef. Stage Door Caf� The same fried foods as Golden Horseshoe without the show. The Golden Horseshoe Eat fried foods while watching stage entertainment. Here you will find a list of selected rides, shows, or restaurants that have been removed fromFrontierland, never to return. Billy Hill and the Hillbillies A comedy musical show featuring bluegrass. Big Thunder Ranch Barbecue An all-you-can-eat barbecue picnic served family style. Now Closed.